The Super Bowl 50 Ads will contain a significant list of car commercials. 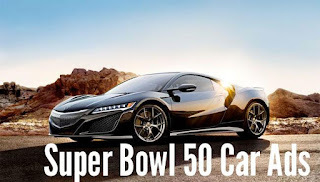 So far eight car brands have confirmed a Super Bowl 50 ad, with several of regular car makers not having revealed their Super Bowl 50 plans. Most notably Chrysler (FCA) has not revealed anything yet about their Super Bowl 50 commercial plans, if there are any. So far our Super Bowl 50 Ad Chart lists Acura, Audi, Honda, Hyundai, Mini, Kia, Buick and Toyota as Super Bowl 50 advertisers. Acura will make Super Bowl history featuring the most expensive car ever advertised during the Super Bowl. The Acura NSX hybrid supercar starts at $156,000. The Honda Super Bowl 50 Ad will promote the 2017 Honda Ridgeline truck. The new Ridgeline debuted this week at that NAIAS 2016. Hyundai is taking the anniversary Super Bowl very seriously and will run four commercials directed by famous directors including Peter Berg. Two of Hyundai's Super Bowl 50 ads will highlight the safety, technology and convenience features of the 2017 Elantra. Another commercial will showcase Hyundai's premium sedan Genesis. Genesis boasts a modern design with luxury appointments. The fourth Hyundai Super Bowl 50 commercial will use storytelling to highlight the core values of the brand and what Hyundai delivers to its consumers. BMW's only Super Bowl 50 commercial is featuring the Mini brand. Several Mini models including the new Mini Clubman wagon. The Kia Super Bowl 50 Ad is featuring the all-new 2016 Kia Optima. The Buick Super Bowl 50 Ad is GM owned car brand's first Super Bowl commercial. Rumors say the Buick commercial will be about the Buick Cascada convertible. Buick just stunned at the NAIAS 2016 with the Buick Avista Concept. The Toyota Super Bowl 50 Ad is set out to be funny and will present the new 2016 Prius. The Audi Super Bowl 50 Ad will be titled "The Commander" and will be 60 seconds long. This is all we know so far. Watch the Super Bowl car ads from last year.